A complete, verifiable and irreversible denuclearization of North Korea is impossible, unless the regime collapses or changes, a former senior North Korean diplomat said Monday. Given the North’s political system that idolizes its leader, North Korean leader Kim Jong-un will never give up the country’s nuclear arsenal, and the only option for the rest of the world is to accept North Korea disguising itself as nuclear-free nation, said Thae Yong-ho, North Korea’s former deputy ambassador to the UK. “It is impossible to completely dismantle North Korea’s nuclear weapons programs. If it doesn’t work, the remaining option is to push for economic sanctions and military pressure against the North,” he told reporters, adding the options would be opposed by China and South Koreans. “Realistically, I think the countries will take a direction of reducing North Korea’s nuclear threats,” he said. Kim will never accept outside experts freely conducting verification procedures inside its country as demanded by the US, he said. “To achieve CVID, North Korea should allow forcible inspections and random access (to its nuclear sites) but it is impossible because North Korea would see it as undermining his absolute authority,” he said. Kim will never give up his nuclear arsenal, but will instead relinquish it substantially -- which he called “sufficient denuclearization” -- to boost its economy and earn support from the international community, he said. The reason he cannot abandon his nuclear weapons programs is because it is the only way for Kim to secure his regime security, he said. Declaring an end to the 1950-53 Korean War, signing a peace treaty and expanding economic interdependence would not be enough to ensure the regime’s long-term rule, according to Thae. His assessment comes before Kim sits down for talks with Trump for a historic summit on the dismantling of North Korea’s nuclear weapons programs in Singapore on June 12. As the US-North Korea summit nears, there have been concerns over whether the countries have the same understanding of what denuclearization means and how to achieve it. The biggest factor behind Kim’s return to the negotiating table is the international sanctions that have throttled the North’s trade -- including coal, iron, seafood and textiles exports -- and limited its imports of crude oil, he pointed out. A month after the most powerful sanctions resolution passed in December, Kim extended a rare olive branch to South Korea in his New Year’s speech, showing his willingness to send athletes to the PyeongChang Winter Olympics and improve inter-Korean ties. “As heavy sanctions start to damage its economy, North Korea is now willing to give up the nuclear weapons programs it already has and its capability to develop more, but it will hide some of the existing nuclear weapons,” he said in a lecture to lawmakers earlier in the day, describing the nuclear arsenal as the North‘s only guarantor of regime security. When it comes to its path for economic development in the future, Thae said it is impossible for the isolated country to completely open its economy to the outside world and allow the free flow of people, capital and information. 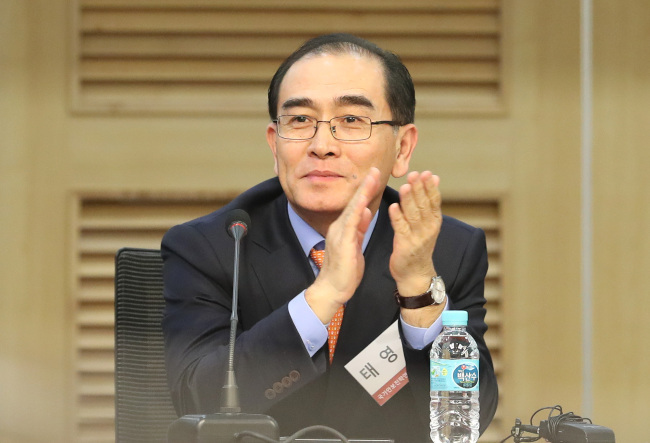 Kim spoke favorably of the Kaesong Industrial Complex and ordered the construction of 14 more such industrial parks across the North, Thae said in his autobiography. Tae published his 554-page memoir, titled “The Password From the Third Floor” in Korean, detailing his understanding of the North Korean leader and the inner workings of the reclusive regime. Regarding the title of his book, Thae said there is an off-limits room on the third floor of the main building of the Workers‘ Party in Pyongyang where Kim greeted South Korean President Moon Jae-in’s envoys in March this year. It is Kim’s secretarial office where his inner circle receive all the reports from the party and government bodies, deliver the reports to Kim and pass on Kim’s orders them, he explained.